In last Wednesday's Travel Post, I shared with you my families visit to Sea World. 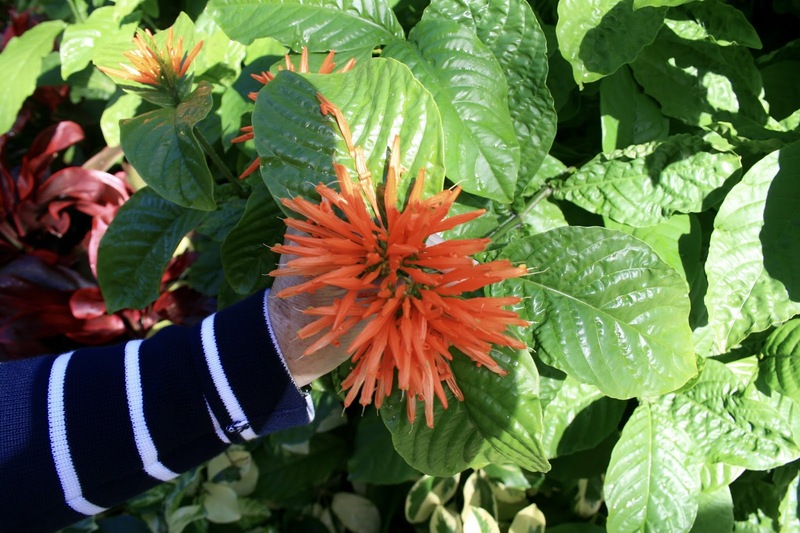 For this week's Sunday Garden Post, I wanted to show you some of the beautiful plants and flowers of the park. I know a lot of people like theme parks for the rides or shows, but my favorite part of theme parks would be the creative elements such as the decor, the costumes, and most of all...the landscape! Because I live in the northern part of the United States, I'm fascinated with tropical plants and flowers. 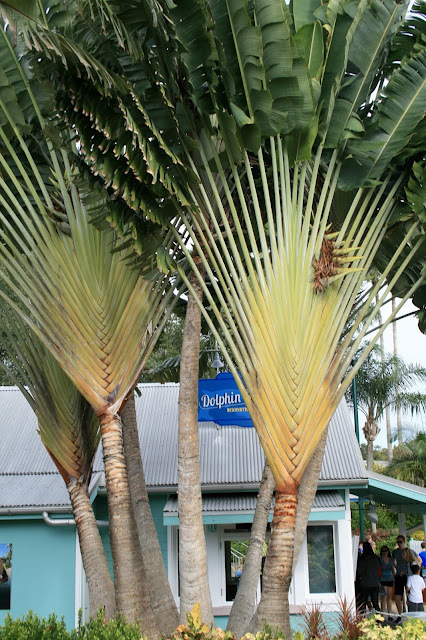 Just look at the interesting shape of these palms! Begonias are treated as annuals in my zone, but in Florida they produce beautiful flowers year round. 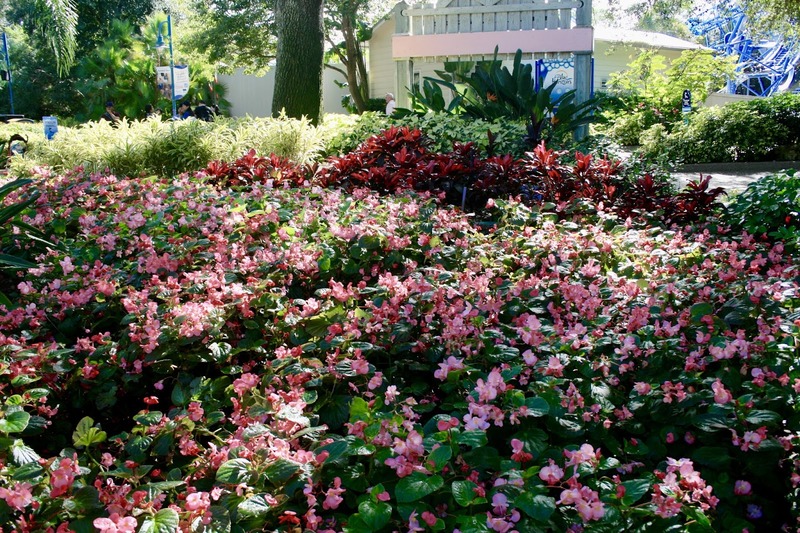 What a gorgeous bed of begonias! 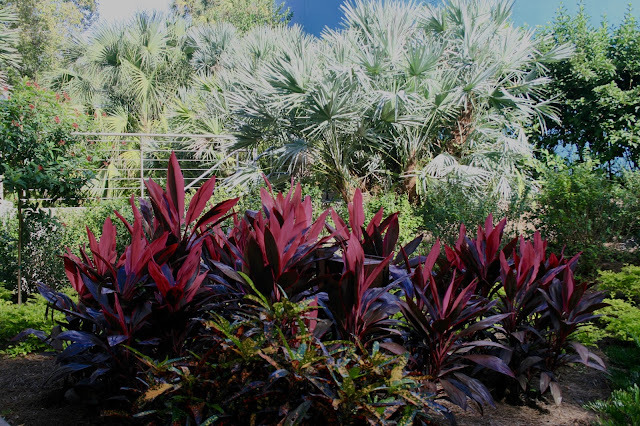 I really like how so much color can be brought into a garden bed by just using colorful foliage. Isn't the deep red of this plant fascinating? What a pretty and unique orange blossom this is! 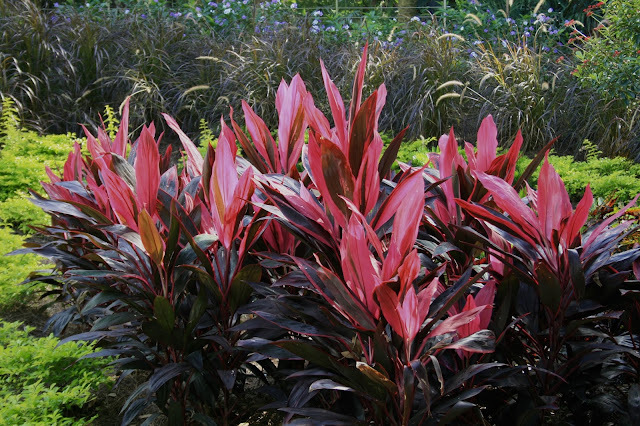 In this garden bed there is another striking deep burgundy foliage plant with contrasting chartreuse colored ferns and dark ornamental grass behind them. I love the graduating height you see in this bed: starting with an interesting spotted foliage plant in the foreground, then the spiked burgundy foliage in the middle, and the silver palm tree in the background. 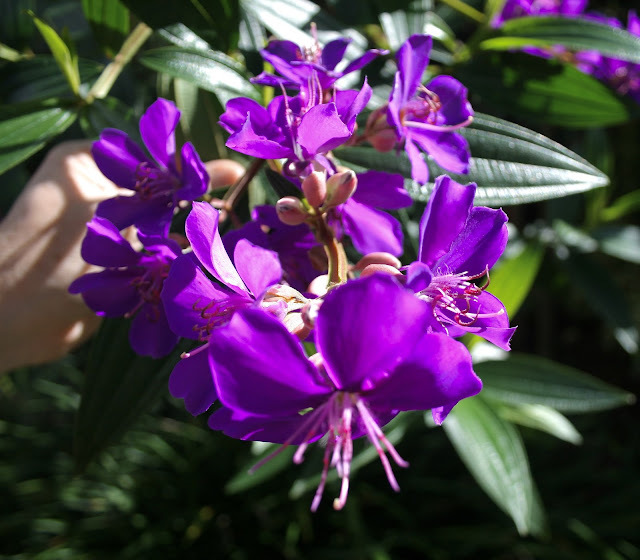 I have no idea what type of flower this is, but we loved the purple blooms. 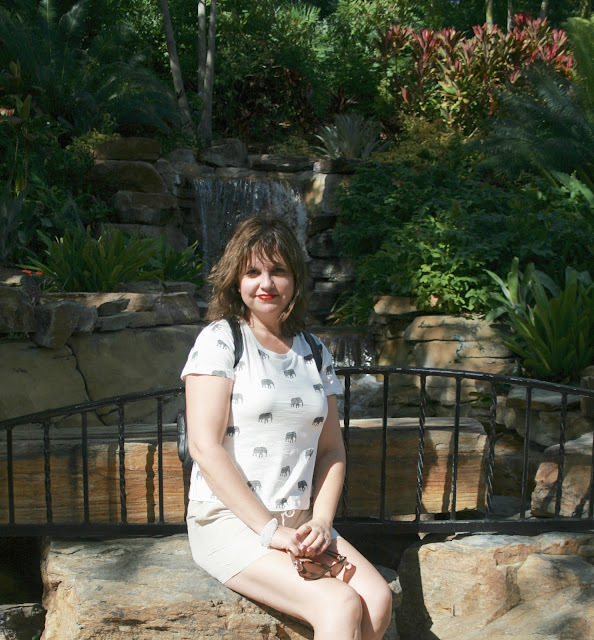 There is a beautiful, photogenic spot in Sea World that has a lovely water fall, plants and flowers in it. All the guests usually wait their turn to get their picture taken in front of it. Is this lush or what? Wouldn't you love this in your backyard? That gorgeous fern on the top always catches my eye. 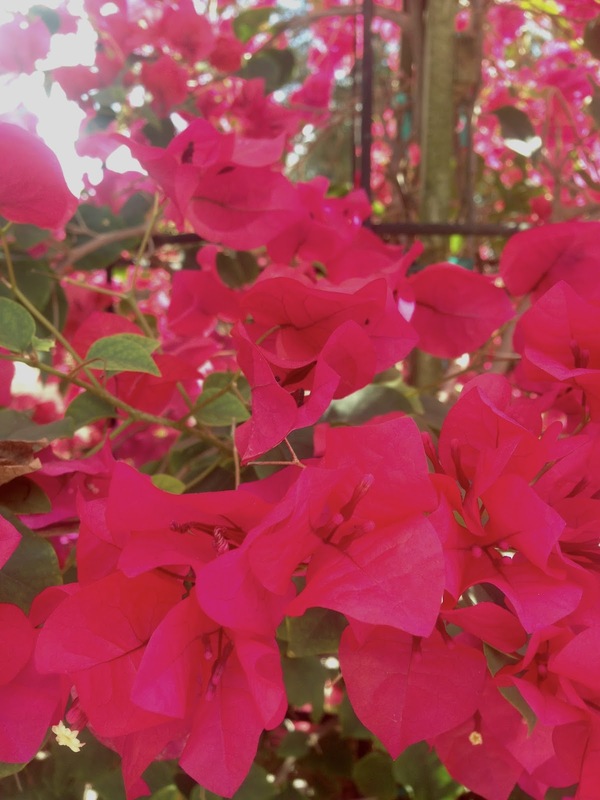 Bougainville was in bloom everywhere the week we were in Florida. It was blooming and growing everywhere we went: in pots, up trellises and windows, in yards....such a breath-taking plant it is! Here is a close up of some of it's sweet papery blooms. 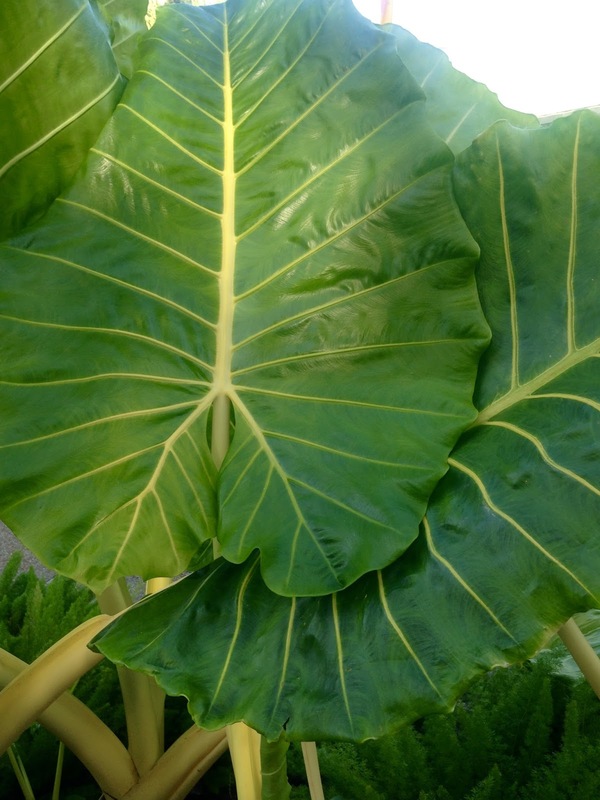 This yellow and green foliage plant is a houseplant in my neck of the woods, but it grows right in the ground in Florida! I loved the size of these leaves! The yellow stems and veins are so interesting as well. Another gorgeous foliage plant happily growing in the ground. 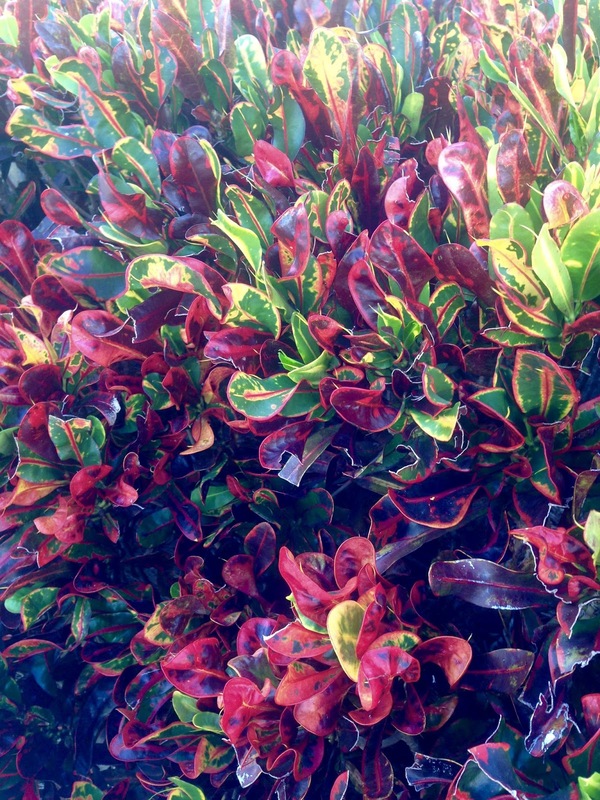 I think I actually have one of these plants in my house! 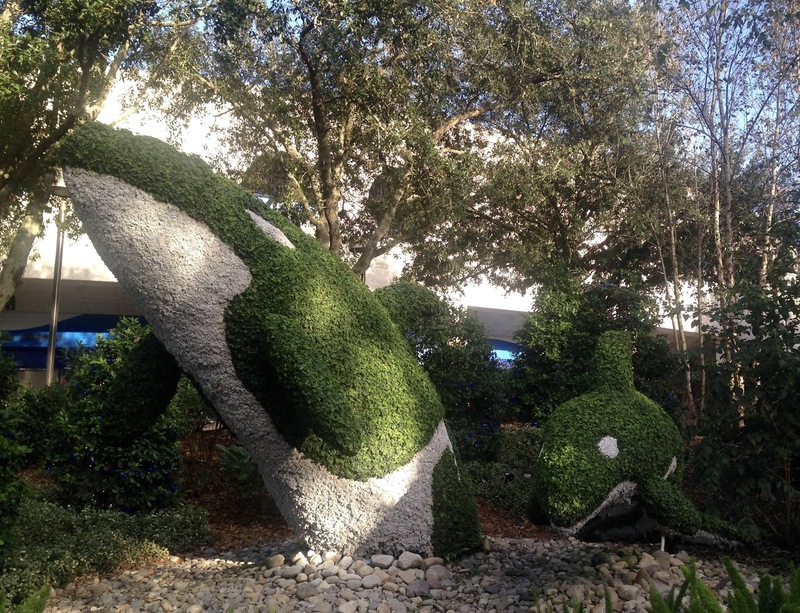 And finally I leave you with a topiary of Shamu and a baby killer whale. This display is right outside the Shamu theater. 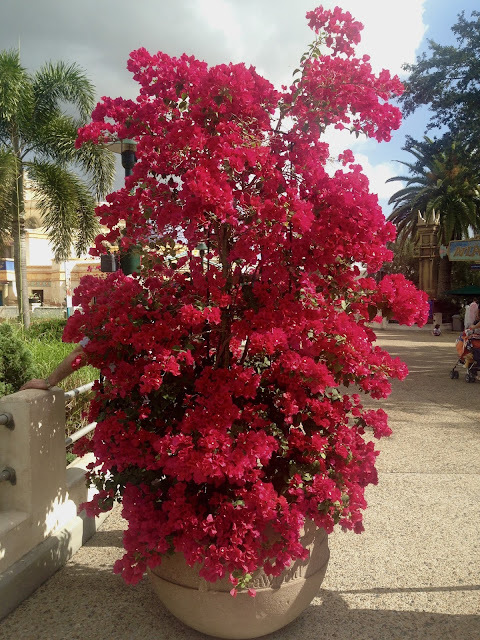 I always pay attention to the plants in theme parks. Beautiful photos! 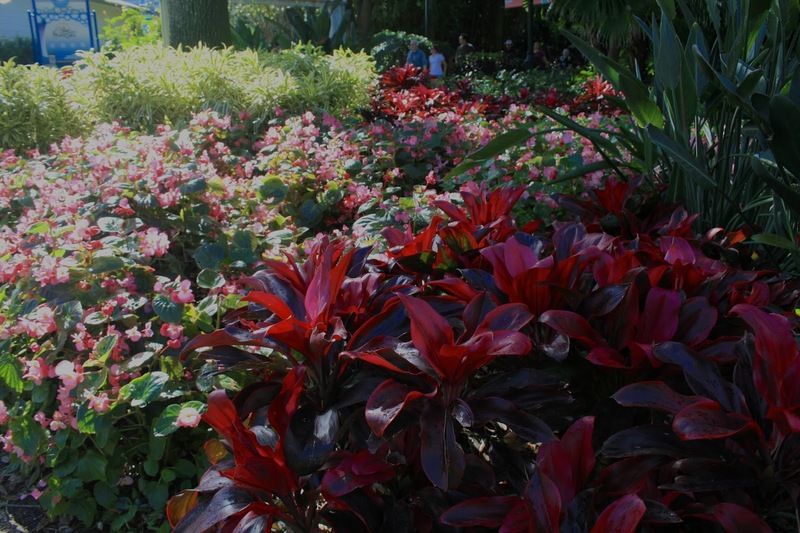 You would love the Flower Festival at Epcot each April. There is an amazing array of foliage and blooms and the arrangements are stunning. I hope you get to visit it someday. It's really something. You have quite a few tropcials here. The rust-colored plant with the yellow blotches is a croton and the giant-leaved plant is an elephant ear. Living in Central Florida, I've seen many of the others, but as tropcials are not my thing, I can't help you with the names. So glad you stopped by The Maple Hill Hop this week! See you again soon! 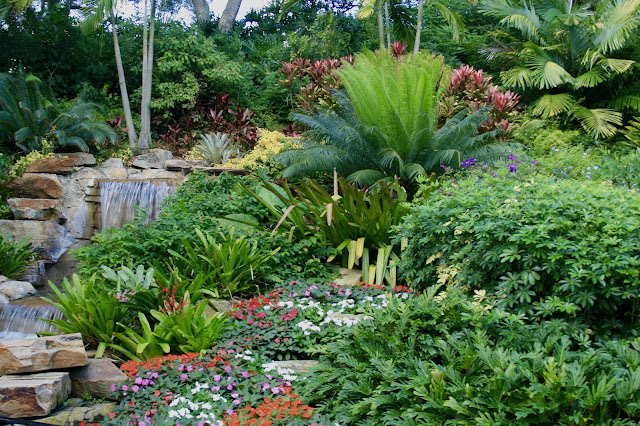 What amazing gardens, Amy! I am glad that they take care of the gardens as carefully as they look after the sea creatures. I think the message that the care about nature is obvious.